The automated bot trading service Cryptotrader has just officially announced the addition of support for trading on two new exchanges – Kraken and Bitfinex. These two exchanges are added along with the already supported Bitstamp, BTC-E and CexIO, the service previously also supported MtGox, but not anymore for obvious reasons. This is essentially the first solution for automated cloud trading on crypto exchanges to provide support for trading on Kraken, a particularly interesting place for trading in Europe due to the large EUR trading volume on the exchange. If you haven’t tried the service yet, you might want to check our review of Cryptotrader first. We can add to that already that the service still suffers from one major problem and that is letting users know about new features on time, a clear example for that is the announcement about the new exchanges… they have actually been available for a while already, more than a week for Kraken and close to a month for Bitfinex. So they really have to do something about letting their users know about new features and improvement in a more clear way and not just send a newsletter once in a while to sum things that have happened in the past two months for example. We have covered the Cryptotrader automated cloud based trading platform a while ago in our short review. An now the service has added a new interesting feature that we believe to be very important for people that are not very experienced in trading and writing trading bots – the group of people that are probably most interested inautomating trading, but are not going to feel at home using Cryptotrader due to the more professional orientation of the service. It seems that the service has added a new feature called Strategy Market where you can essentially “rent” a trading bot written by another user or sell your good trading strategy if you can program one yourself. Algorithm authors can list their algorithms in the Strategy Market as either a Free or Paid Strategy. Free strategies may have protected source code or not depending on author’s preference and the source code of paid strategies is never revealed, though apparently an option to buy the source as well is being worked on. Currently there seem to be about 20 paid strategies already with just a few free ones also available for you to try. 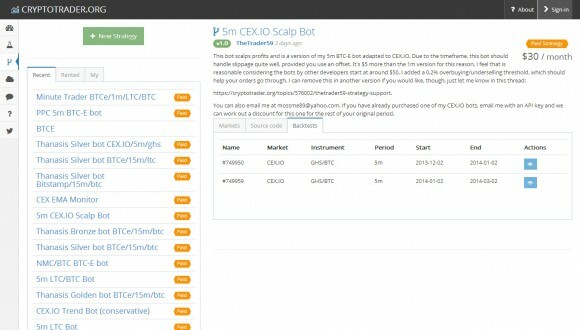 This new feature can actually make the Cryptotrader automated cloud based trading platform more appealing to new users that are looking for an easy and automated solution to trade at Bitstamp, BTC-E or CEX.io exchanges without having to write their own automated bot. Note that paid strategies are not going to guarantee you profit, but since they are going through an approval process at least you should be expecting to get a decent trading strategy that does not come with a high risk of loosing. Nevertheless you should also be careful with paid strategies as most of them do not come cheap and though they would probably cover the cost by making you some profit, again there is no guarantee that they will ensure you profit, so be careful with them as well! To be able to really try the service you will need to subscribe for a Basic license that costs $8 USD per month as this will give you access not only to full backtesting access, but also the ability to run a single simulated trading bot. If you want to be able to actually trade with real crypto coins or cash in a supported exchange you will need to go for at least a Basic+ subscription plan tat is priced at $24 USD per month… this is the plan we went for to test the service. The other more expensive plans offer extra features such as more bots and higher trading account equity limits, but if you want to try out the service yourself we would recommend to start with the Basic+ plan as we did and then if you decide to keep using it you can upgrade to a higher plan. 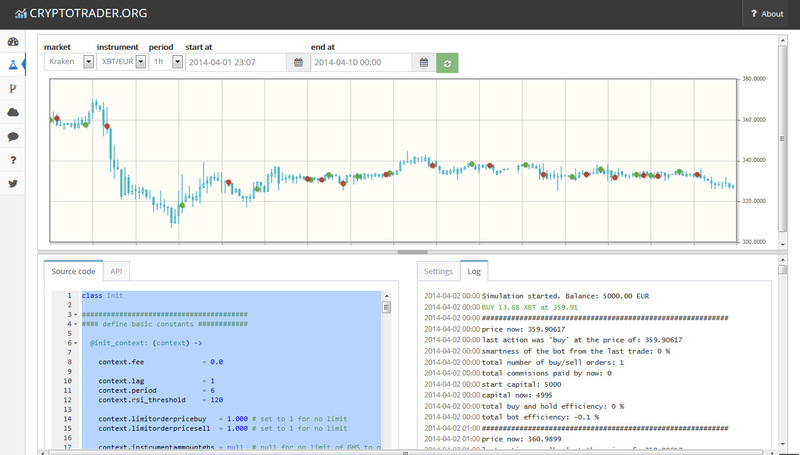 The idea behind Cryptotrader is that you can program your own bot with a trading methodology of your own using some readily available tools and a simple to use scripting language. However you do need to be good enough in market technical analysis and have a bit of programming skills in order to program your own bot, so it is not as easy as you may initially think. There are also a lot of users that do share their trading bot code for everyone to try out and optimize, which is the easier way to start using the service, however it is also riskier for you. Most of the trading bots shared are not finished and polished, so by using these you may end up loosing more than earning, furthermore they are not well documented, so that you could easily tweak them for better performance. One of the things that is common for most of the publicly available bots for trading at Cryptotrader use all of the coins and money you have available on the exchange and you should be very careful starting actual trades with these if your account does have large amount of these. 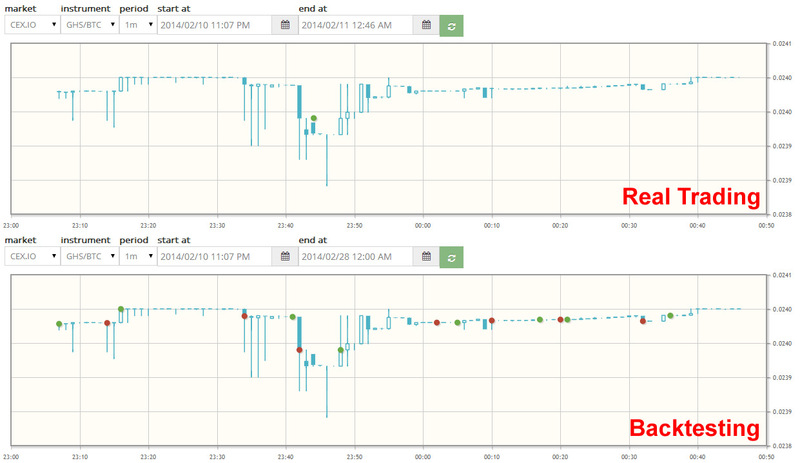 Also as you can see from the example on the photo above doing backtesting on a automated trading bot on already available market data can differ a lot compared to actual trading with the same code as there are many factors that influence the results such as large buy/sell orders not filled completely and timing out. 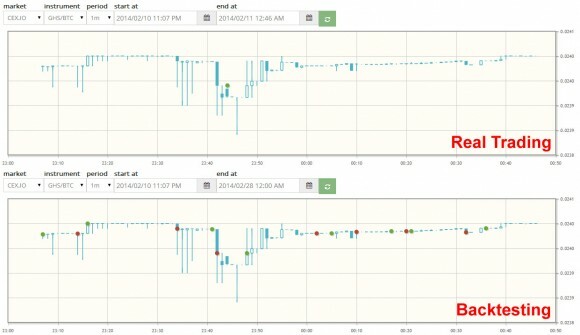 Our testing of various publicly available automated trading bots that show decent profitability during backtesting has shown not so good results with actual trading and so far for already a few days of testing the service we’ve gotten quite used to the code and can further improve and optimize the code publicly available and trading on CEX mostly is still resulting in general minor loss of the starting balance. So we would advice not to go for trading just on the CEX exchange using Cryptotrader and if you are not sure you are going to be able to write your own trading code to better avoid that service as it is not for everyone and most definitely not designed for normal users. We are still going to play with the service until our one month plan is over, but after that we are probably not going to be renewing it and are instead going to try some other alternatives that we still haven’t tested yet. You are of course welcome to try out the service yourself, just be warned and be aware that it is not for everyone and most definitely not for normal users without decent trading experience and programming skills!